The blog has fallen silent as my research and contemplation deepen. On the heels of reading Many Lives, Many Masters, I was introduced to Journey of Souls, which details the realm between lives as described by hypnotized persons. I plan to review the book in detail in a future post, once I’ve finished it and had time to let it settle. For now I’ll say that it is audacious in its specificity: aura colors denote enlightenment “rank”; advanced souls practice manipulating matter on a “sandbox” planet; groups of souls study with special “living books” in classrooms. What began as an awe-inspiring account of the afterlife began to look too consistent and specific—even bureaucratic—to be an accurate representation of what happens between lives. Since then I’ve struggled between openness and skepticism as I work my way through latter chapters. 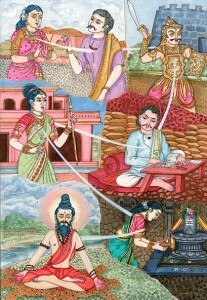 What is evident, though, is the large volume of works on the subject of reincarnation. Even in negative Amazon reviews for Journey of Souls, reviewers suggest other books they claim represent the afterlife more accurately. I plan to dive deep into this realm in an attempt to collect an “average” model. I’d also like to undergo past-life hypnotherapy myself, hoping I haven’t tainted the experience with the expectations I already have! Many thanks: for reading so far; for Like-ing and tweeting and such; for comments, suggestions, encouragement, and love! Keep ’em coming! ~ by Grant on July 24, 2012.